Jayashree Jayaramakrishnan has been learning and performing for the last 17 years. Having started initial learning from her mother, Mrs. Seethalakshmi. 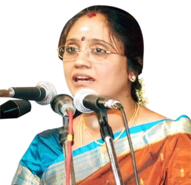 Jayashree Jayaramakrishnan further learnt music from Mrs. Muthumeenakshi (Disciple of Musiri Subramania Iyer). Mrs. Jayashree has won several awards. She is a recipient of the “Sangeetha Seva Mani” Award from the Acharyas of Kanchi Kamakoti Peetam and also a recipient of the Shyama Shastri Endowment Award from Sri Krishna Gana Sabha. Her performance at various places includes performances at Kanchi Sankara Mutt during the Chathurmasya period, Sri Krishna Gana Sabha, Vani Mahal Nungambakkam Cultural Academy, AIR and Doordarshan. Mrs Jayashree has been judging for Music Competitions in various Schools and Colleges and teaches Music to many students.